The screen of this phone is just pathetic. The brightness is so low which makes the outside visibilaty so poor, I can't even see what's on the screen. I wouldn't take this phone when there're beter phones for the same price, the huawei P6 is a far better phone and it has a quad core CPU! Hi guys, have this phone for a week now and this is my experience after using an HTC Desire S. The screen is good, no distortion of colours from any angle. Internet seems faster on Edge with Vodacom SA than the Desire S, after switching on 3G the internet just flies! I doubt there is Gorilla Glass used on the screen as my unit had a tiny scratch on it after one day of it being in my jeans pocket. Have a screen protector on now so I don't worry about that. Battery Life: I get just one day of use with the screen set to. 50% and using 2G network. I believe this is because I have Whatsapp installed which keeps a constant connection open. Haven't played much games yet, but. psx. emulator seemed to work okay. reading apps and videos play well. Will install games after I update to Jelly Bean. ami, 18 Apr 2013Someone plzzz tell me.......which one I should buy ??? Galaxy grand or optimus l9 ? ?lg l9 is much much better than grand ! i bought lost month i am very happy with all feature. This is a great smartphone! Performs very well. Very happy. Someone plzzz tell me.......which one I should buy ??? Galaxy grand or optimus l9 ?? u can move ur apps to sd card which r installed from google playstore. at first u need to install bluetooth app sender. u need 2 send the apps to another devices via this bluetooth app. and then u have to receive the app from that device. simple u can enjoy this app. Hi, I just bought this phone, and have one question: where do you guys have voice dialing?!? For now i hate this phone, my old C6-01 works with BT headset without any problem, and this phone do not... why you write that? 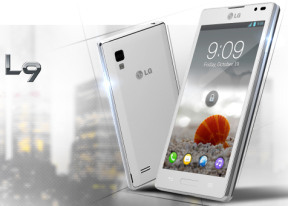 Hi,any one knows if "LG Optimus L9 P768" version features gorrila glass? AnonD-77171, 15 Feb 2013it does!Hi..am using l9..plz advice how to move apps to sd..the app which i downloaded From google play is not Workin..
mrp, 11 Feb 2013It does not have the ability to transfer apps to memory. A very big headache for people who i... moreit does! It does not have the ability to transfer apps to memory. A very big headache for people who install a lot of games. Pls be careful.